Most DJs have heard the legend of the incredible Innofader – but did you know that this epic fader now has a little brother? Designed to accomodate the many MIDI controllers that don’t have room for a full-sized Innofader, we’ve got the rundown and comparison on this low-profile superhero of a crossfader. Since its launch, Audio Innovate’s Innofader has garnered a substantial fan base and a reputation as one of the best faders on the market today. 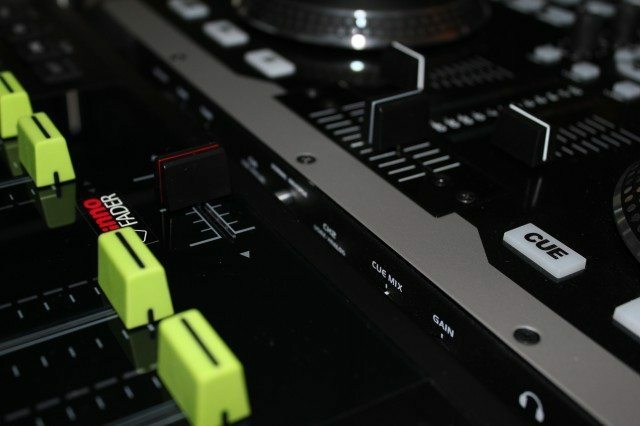 The Innofader was designed to be sold as an alternative to stock mixer faders and quickly became the favored upgrade for turntablists and DJs who punish their faders into rapid submission. It’s is built to comfortably withstand long term abuse while offering a tactile experience that’s smoother and more enjoyable than most, and at $150 it should certainly be expected to do all of that (in addition to making you better looking and able to live longer). Throw in the “Innojuster” which allows external access to cut-in and curve controls and with shipping, you’ll quickly find yourself bouncing over the $200 mark. So, given the surge in budget controllers and budding DJs, where does the Innofader brand go from here? The answer is the “Mini Innofader” – a short body version of the standard Innofader with a preset configuration. The Mini Innofader isn’t the standard Innofader with a smaller footprint. The Mini Innofader is a bare fader without the standard casing you see with the other Innofader models. Put the fader next to the S4’s stock Alpha fader and you would be hard-pressed to tell the difference unless you were to flip it over to see the words “Mini Innofader” printed on the PCB. For those of you who own Innofader products, you’ll be disappointed to hear that there’s no accompanying bag stuffed full of adapters, screws, cables, spacers, lube, stickers, washers and that tiny, little screwdriver. There is no mechanism to change the cut-in, curve or tension on the unit. Everything you might expect to see with an Innofader product is gone because the Mini Innofader is not for you. At least not right now. 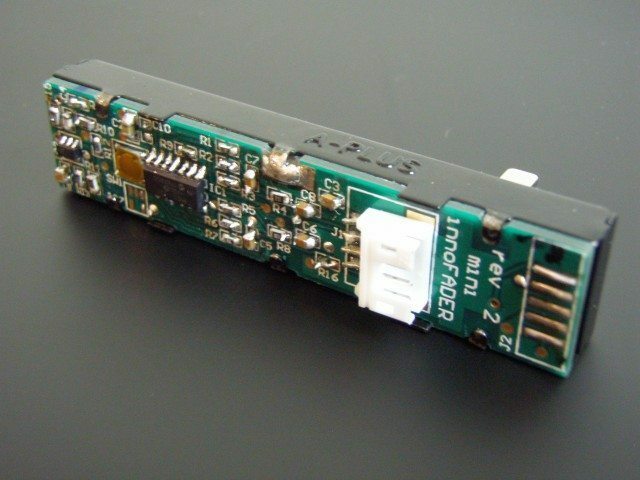 The Mini Innofader has been designed for the OEM (Original Equipment Manufacturer) market meaning you can expect to see this fader turning up in any number of mixers and controllers later in 2012. The business model is much the same as Intel who sell the vast majority of their processors through laptop, desktop and server manufacturers or Alps and Alpha who sell their faders to Vestax and NI. As for which manufacturers will be sporting an “Innofader Inside” style badge on future product? That’s yet to be seen. The small form factor and lighter tension on the stem makes it clear that these units are heading straight for the smaller controller market and trying to offer a balanced feel that will appeal to controllerists and controller owning scratch DJs alike. The Mini will also appeal to manufacturers who want to market a more robust, user serviceable fader in order to differentiate their product from the pack and reduce unit returns and technical support costs. Audio Innovate also tells us that there has been a lot of interest from lighting console manufacturers. The net result of all of this is that fader game has gone up a notch, meaning better equipment for us. Availability: OEM: Now. Retail: ??? Many of you will be reading this and be disappointed that the Mini isn’t going to be available as a standalone fader replacement. The good news is that Audio Innovate has certainly not ruled out doing this at some point. The bad news is that it “may” be available “at some point”. 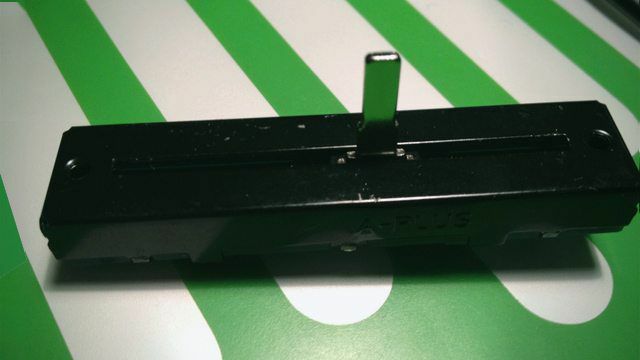 When asked if they would consider selling the bare OEM fader to ardent modders the response was, “The squeaky wheel might end up getting the grease” so if you are happy to bug them and comfortable truly going it alone with the installation, there may still be a way to convert that low profile controller into a scratch monster or cue-point thrasher. It’s no secret that I am an S4-owning NI fanboy, so it was an interesting proposition when American DJ approached me about using the VMS2 as the test unit. As it happens, the ADJ VMS2 is also chiefly the work of Elliot Marx at Audio Innovate. The unit is certainly compact with all metal construction for the body and certainly feels slightly more robust and heavy than the S4. There are also some other interesting features such as curve control and hamster mode on the cross fader, as well as the ability to use the unit as a standalone mixer with a separate booth out. The installation of the Mini Innofader took ten minutes and was a breeze which is impressive given that no connectors or cables were available at the time of installation. 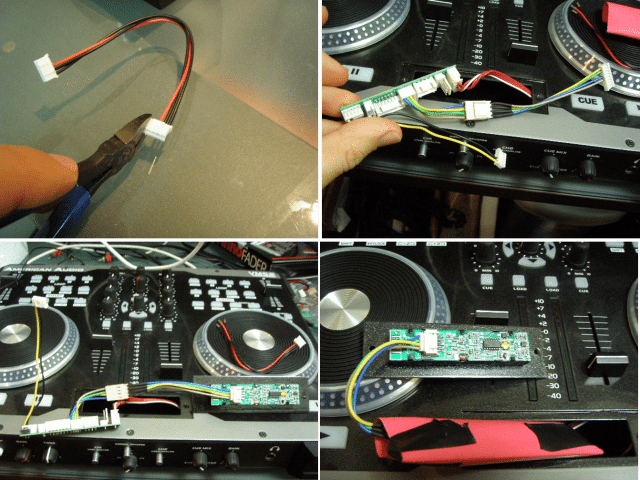 Luckily I was able to modify a spare cable and connector board which came with my own Innofader. Switching out the stock VMS2 crossfader for the Mini Innofader couldn’t happen too soon. Let’s just say the VMS2’ stock cross fader was not something I wanted to spend too much time with. While the hardware upgrade was very simple, the software side was less straight forward. The VMS2 ships with Virtual DJ and the Traktor mappings for the VMS2 were hard to track down and (understandably) seem less reliable and responsive than what is delivered with the S4 and Traktor Pro 2. We ended up testing the VMS2 with Virtual DJ LE which shipped with the unit. The Mini Innofader sample that I was sent has the same ultra-smooth glide of the original Innofader but there is definitely a little more tension to the fader’s stem. To get another comparison point I compared it with the S4’s Alpha fader. Test these two side by side and you’ll instantly appreciate what a difference this non-customizable OEM fader will make in a unit. After nearly a year happily using the S4’s Alpha fader, it now felt scratchy by comparison, with the stem feeling as if it was being reluctantly dragged from one side to another. If Native Instruments was looking to broaden the appeal of their flagship controller, they could do a lot worse than switching to the Mini. Update: It’s been a few weeks on since writing the last paragraph and in that time my opinion on the Mini’s “stiffness” has changed. A couple of weeks of playing with the unit has removed a little of initial stiffness and left a very pleasing level of tension in the stem. In fact, I went back into the S4 and made a few tweaks to mimic the feel of the Mini. This is arguably an unfair fight from the outset. The S4 is the flagship controller from a leading brand and comes with a price tag that’s more than double its opponent. A similar situation exists with the Innofader and the Innobender , though there is no current information on how much a Mini Innofader might retail for in the future. In terms of performance the S4+Innofader+Innobender is the clear winner. The overall experience is more rewarding and as longer term investment the Innobender’s adjustability will allow it to evolve with the DJ. There is however a place for the VMS2+Mini Innofader combo. Those in the market for a budget digital setup that’s flexible enough to accommodate DVS or even a laptop-free vinyl/CDJ configuration could do a lot worse than an Innofader upgrade in a budget for cutting and scratching. If the price of the Mini Innofader is competitive enough for manufacturers to switch to it, it can only be a good thing for us users. There are far too many great products on the market let down by sub-standard faders. It will be interesting to see which vendors pick this up and what kind of configuration they opt for. The Mini could also open the door for the rest of the Innobunch. It’s not difficult to imagine DJs loving the action on their crossfader but wishing they could tweak it one way or another. The smarter vendors out there might look into setting up some kind of upgrade offer. Regardless of what happens, this is certainly an opportunity for Audio Innovate to get past the “What? $150 for a fader? !” hurdle.